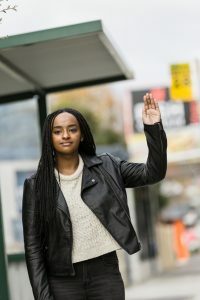 Click on the tabs below for frequently asked questions and information about catching buses in Hobart, Launceston and Burnie, or watch a series of six helpful videos, created by University of Tasmania students as part of a Sustainability Internship Program. We think the easiest way is to use the Trip Planner. If you need help using the Trip Planner, see the next tab for a guide. select ‘plan my trip’ to see a list of travel options. Click on an option to expand it and see a map and details of the bus stop, route number and times. filter results to only show low floor buses. All buses will display a route number and route description above the windscreen, on what we call the ‘destination blind’. In the example above, the bus is operating a route 60 service, which travels to Wynyard via Somerset. When waiting at the bus stop, keep an eye on the destination blind of approaching buses to know which one you need to hail. Each bus also has a unique three digit number, which is helpful to remember if you need to contact us about something specific. You can pay your fare to the driver using a Greencard or cash. See the next tab for information about Greencard. have any concession cards ready to show the driver. Click here to see fares, and here for information about concessions. When boarding, simply tap your Greencard on the driver machine and your fare will be deduced from your credit – no need to tap off. *To top up online, you must activate your online account. To do this, click here. Don’t have a Greencard yet? You can apply for one online, in person, or by calling our Customer Service Hotline on 13 22 01 and requesting that an application form be mailed to you. To apply online, click here and fill out the form. To apply in person, visit the Metro Shop, a Metro depot or Metro agent. Wheelchairs, scooters and prams are welcome on board. Safety is our priority so follow your driver’s instructions. 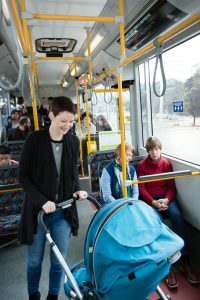 When occupied, these mobility aids must be stationed in the designated area, facing towards the rear of the bus with safety features applied. 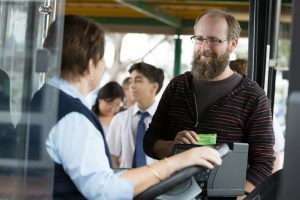 To search for services that will be provided with a low floor accessible bus, check the wheelchair icon on timetables or the Trip Planner, or call 13 22 01. Your luggage is your responsibility. Please help keep the bus safe and walkways clear by placing large items in the luggage areas. If the item is too big or could be dangerous on board, we may not be able to carry it – ask your driver if you are unsure. 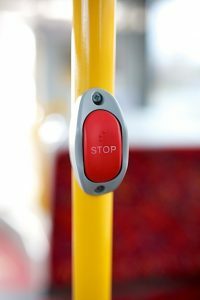 When approaching your desired stop, press the button near your seat to stop the bus. A sign near the driver will light up when the bus is stopping. Hold hand rails and supports until the bus has come to a complete stop. Some buses have a back door that may require you to push when the light is green. fares capped at low rates for all-day travel*. Click here to learn more about Greencard, or here to apply online. There are different caps for adult and concession fares. Students pay one low daily cap no matter when their first boarding is made. Daily caps apply to urban travel. Peak daily caps apply when you board before 9am on a weekday. Standard daily caps apply at all other times including public holidays. Click here to see a full list of urban and non-urban fares. Click the image below or here to check out our dedicated tourism page, featuring many attractions in the Hobart region accessible by Metro bus. To help make everyone’s journey at pleasant and safe one, we have some conditions of travel. A full list can be found here. offer your seat to passengers in need. Safety and security is at the forefront of our business. We are committed to ensuring all Metro employees, visitors and customers are treated with dignity, respect and are free from discrimination and harassment. If you need help, ask your driver for assistance or contact our customer service team on 13 22 01. If you have lost something on board, contact our customer service team on 13 22 01 for assistance. If the item has been found, you can arrange to collect it. In Hobart, you can collect lost property from the Metro Shop, 10am to 4pm Monday to Friday (unless you have contacted us to arrange a different collection time). 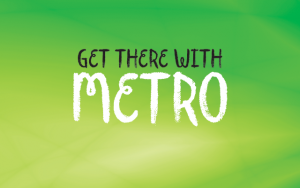 In Launceston and Burnie, you can visit the Metro depots between 9.30am to 5pm. Due to storage restrictions, lost property is typically held for two weeks before disposal or, in the case of high value items such as wallets, surrender to Tasmania Police.